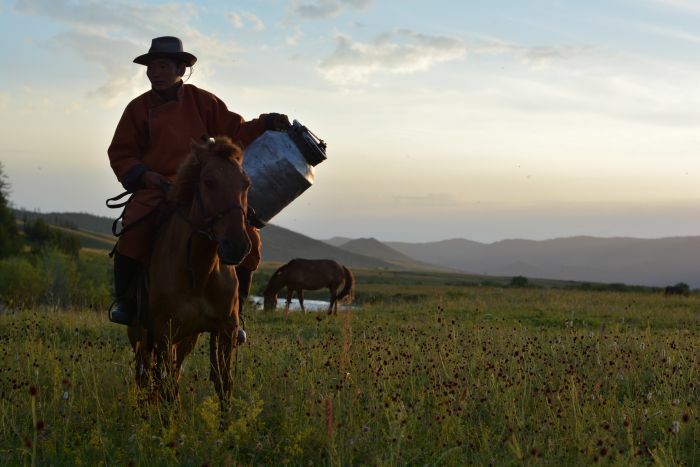 This journey on horseback is a close encounter with Mongolian horsemen and their horses, nomadic people who have thus far survived modern pressure and lifestyles. There is no other nation in the world that so much depends on horses. 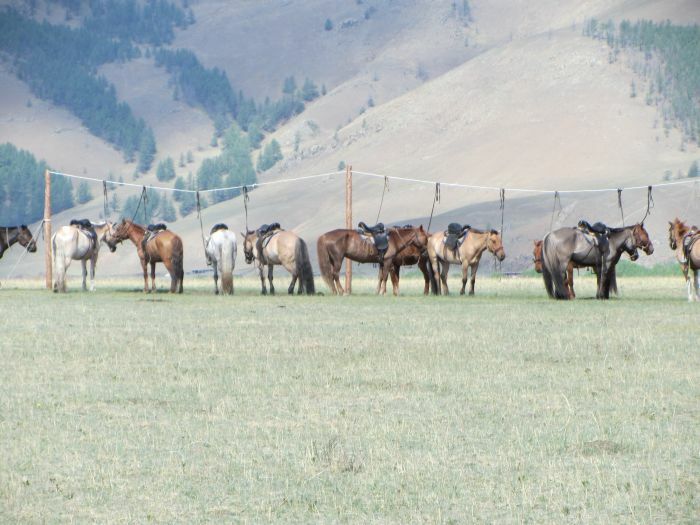 Mongol horsemanship is famous and strikingly different than anywhere else. The herders keep their horses in a semi-wild condition, allowing them to live freely in harem groups. During the harsh winter of subzero temperatures, the horses fend for themselves and protect their foals against predators such as wolves. There are no fences or any stables anywhere. 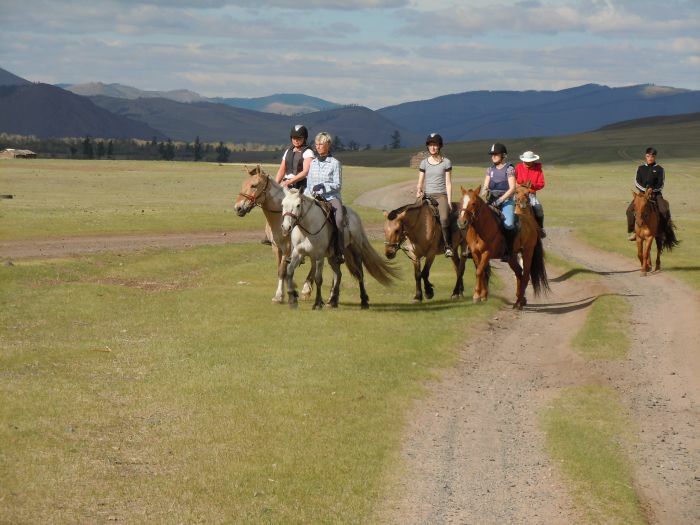 We will ride out on the steppe, which is the summer pastureland of Mongolian nomads. 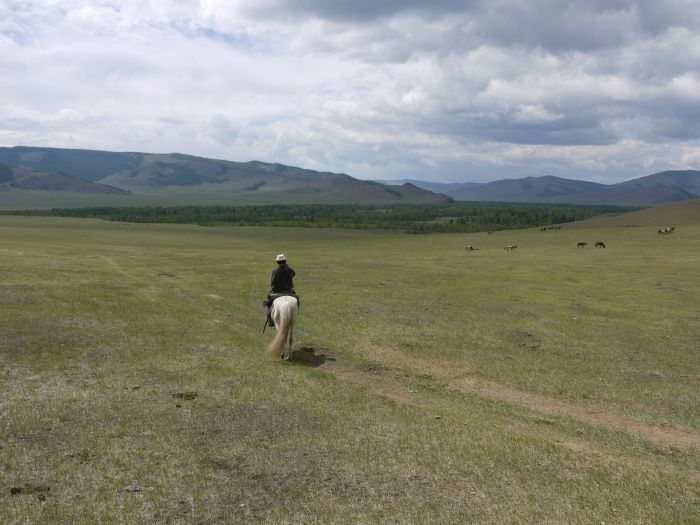 We will ride in two strikingly different areas; first, the treeless steppe and then through the Khan Khentii Strictly Protected Area, which is in the mountain and forest taiga zone. We will start this horse ride as A Nomadic Journey, e.g. with- out vehicle support, in wild terrain. Our luggage will be loaded onto yak carts; a ger will be carried to serve as our mobile restaurant. The beginning of the ride will be on the steppe and gradually we will ride into the very scenic forest steppe and southern taiga lifezones. You will experience mountains, steppes, forests, wooded meadows and camping along the rivers. It will be an uncomparable advernture. Day 1: Ulaanbaatar Arrive in Ulaanbaatar. Transfer to your hotel. Tour briefing after dinner. Day 2: To the Steppes A.m. Visit the Gandan lamasery, possibly in time for the prayers, the center for the Buddhist revival in Mongolia. The Mongols follow the Tibetan version of Lamaism, the Dalai Lama being the supreme theocratical leader. We depart for the steppe and have a picnic lunch on arrival, pitching camp near some nomadic families. Here we will meet the yak carts and our horses. Day 3-4: Steppe ride Ride over the treeless steppe. We will ride across rather hilly terrain with occasional patches of birch forest. Throughout the ride we will have contact with local herdsmen, often relatives and friends of our wranglers. Our support structure is free from vehicles. All our provisions, camping equipment and luggage will be loaded onto yak carts. Even a ger (yurt) will be brought, and we will learn how to set it up. On the last day, forests will suddenly start to appear and we are now riding towards the Hentii wilderness area, which includes the Khan Khentii Strictly Protected Area and Gorkhi Terelj National Park. In Mongolia the Siberian boreal forest meets the Cen- tral Asian desert and steppe. All the while we will be riding in this transition zone. Day 5-6: Today the horses will now make it possible to ride through the larch forests, up the slopes of the mountains and to follow ridges that have views of superb scenery, whilst the yak carts will follow the broad river valleys. We will arrive and pitch camp. We will spend two nights here and it will allow for some flexibility in the middle of our ride. Day 7: To Tuul River Cross a pass and ride into the upper part of the Tuul River Valley. We are now near the main ridge of the Hentii Mountains. The horses will help get us up onto the ridges where the panoramic views are ex- traordinary. It is a partly forested area. Day 8-9: We will ride towards Jalman Meadows, famous for its wildflowers, and reach our semi-permanent ger camp, which is situated a next to a beautiful wooded meadow on the upper parts of the Tuul River. We will overnight for two nights, making a superb last day ride in the area. Day 10: To Ulaanbaatar A.m. Return to Ulaanbaatar and check into the hotel. See the capital city on your own. Distances are short. The local guide is standing by to assist finding out where your points of interest are located. Day 11: Departure Transfer out to your next destination.